And by ASAP I mean sometime during the last two weeks of February – but only if the judge overseeing Kelsey’s divorce from Camille gives the go-ahead next week. Claiming that he’s met almost all the legally required conditions for a quickie divorce, Kelsey Grammer has asked the judge to officially grant the divorce next Wednesday. Keep everyone honest? How does putting up a bond keep everyone honest? In related Grammer wedding news, Kelsey Grammer’s eldest daughter, Greek actress Spencer Grammer, has recently become engaged to her boyfriend James Hesketh. Hesketh popped the question to Spencer with an Irish claddagh ring, which is given as a token of love or friendship and traditionally features two hands clasping a crowned heart. Life & Style broke the engagement news. Side Note: Kelsey and Spencer were fairly estranged for many years, but now that Camille is out of the picture, he and his first born have become close once again. 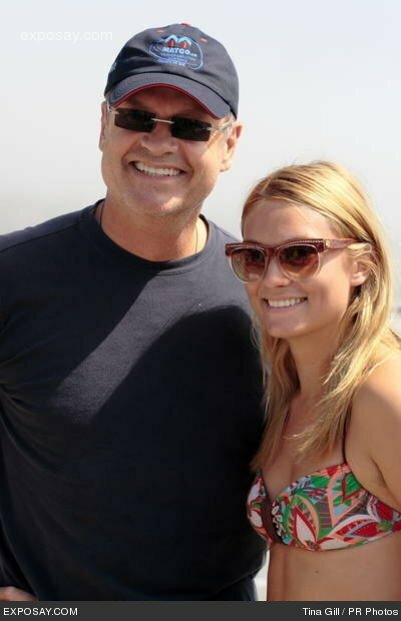 This is pretty much the only picture I could find of Kelsey Grammer with his daughter Spencer Grammer. It’s from the Oceana’s Celebrity Free Surf in 2008. 54 queries in 1.411 seconds.